By Charles Boehm – WASHINGTON, DC (Mar 28, 2019) US Soccer Players - Occasionally soccer matches turn out to be Rorschach tests, partially-consumed glasses of water that take on different looks from different points of view. You could certainly say that about the USMNT’s 1-1 draw with Chile on Tuesday. Watched in real time, on television, the eye test suggested that the hosts were lucky to grab a draw against a talented and committed opponent that generally controlled possession and the tempo of the game. The result ends a run of three straight victories at the start of coach Gregg Berhalter’s tenure. It was also the second straight match featuring a discouraging injury to a promising young starter, with Christian Pulisic picking up a quadriceps issue five days after Weston McKennie’s turned ankle vs Ecuador. With a bit of distance and some input from the players and coaches themselves, the picture looks more positive. Chile is the defending Copa America champions, one of world soccer’s biggest success stories of the past decade. Even in a down phase under an embattled coach, they brought a hard edge to this match. That posed a new tactical challenge for the US, one diametrically different to Ecuador’s caginess in Orlando. 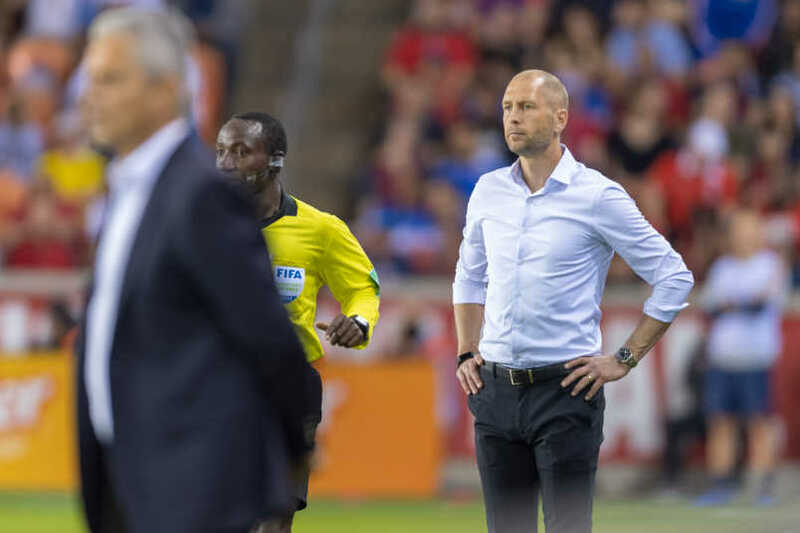 Berhalter’s analytical approach to his craft is the story so far for the USMNT. Four games in and observers can make out the general framework of his vision. Lessons, experiments, and known variables are stacking up with each successive game. The technical staff appears to be processing it all with a data-oriented outlook. Here are a few themes to consider as focus shifts back to club play before a busy Gold Cup summer. As most coverage noted, Chile was the protagonists. That's the norm against every opponent in their modern era of high-intensity pressing play. Even with some of their most influential stars now on the backside of their careers, La Roja remains a fearsome side. They're capable of blending world-class fitness and bite with comparable levels of technical quality and attacking creativity. The numbers show that they were tough for the USMNT to handle on Tuesday. Oscar Opazo’s clinical finish quickly matched Pulisic's quality early goal. Chile eventually carved out 11 shots (three on target) to five (one on target) for the USA. Chile's harrying took a particular toll on Berhalter’s preferred method of building out of the back. In the second-half he adjusted his formation and personnel to batten down the hatches. This isn’t the first time Chile has done this to an opponent and it won’t be the last. You could say something similar about the USMNT’s recurring issues in coping with these tactics. Most fans will know this discussion well. The US has traditionally faced a jarring task in toggling back and forth between the approach needed to break down the bunkered ranks of smaller CONCACAF nations and the more conservative posture often required against the global elite. We haven’t yet seen Berhalter’s full response to this puzzle. It’s been less than three months. That’s why Tuesday could prove such an important data point. The coaching staff has gotten to evaluate a good number of players already. Now, they have 90 minutes of match footage to dissect and use as a barometer for the collective. Like any other team, Chile’s strengths can turn against them. We saw glimpses of that on the occasions that the USMNT passed through or around their lines and found space to create more attacking danger. The US goal came via a moment of what many would call “Route 1” play. There’s no shame in that, given the precision with which Pulisic and his setup man Gyasi Zardes executed. The possession-oriented Berhalter blueprint might be hipper and more instinctively appealing, and it will have its place. It can’t be the only club in the proverbial bag, though. The coaches’ job is to familiarize their squad with at least a few models of play, then deploy them at the proper times and places, and make it all happen as smoothly as possible in the compressed timeframes of international play. The best USMNT teams of the past had a good sense of this pragmatic balance, as do consistent contenders like Chile. Which brings us to one of the loose ends coming out of this international window. Will Berhalter follow through with previous mentions of pressing as a possible option for the US themselves? He appears to be going methodically, step-by-step with his curriculum so far. He hasn’t had enough time, or an appropriate opponent, to try out a high press. It’s intriguing to ponder what a more direct, physical mindset might unlock from this player pool. Tab Ramos has had some success with it at the U-20 level. With nothing technically on the line in a friendly, there’s a tendency to dismiss the value of avoiding defeat in a game like Tuesday’s. That would overlook some key context. Going back a long way, one of the cornerstones of the USMNT’s identity was a powerful sense of fight and resilience whatever the situation. Everyone involved has admitted that this tradition wavered somehow at some point in recent years, at a cost. So in the circumstances, denying a team like Chile a win provides a reference point for a new group at the dawn of a new era. Belief counts, built in small increments that are hard to perceive with the naked eye. For a country that tends to be more comfortable when punching upwards than playing the Goliath role, it’s a good thing that much is left to prove when the spotlight gets brighter come June.